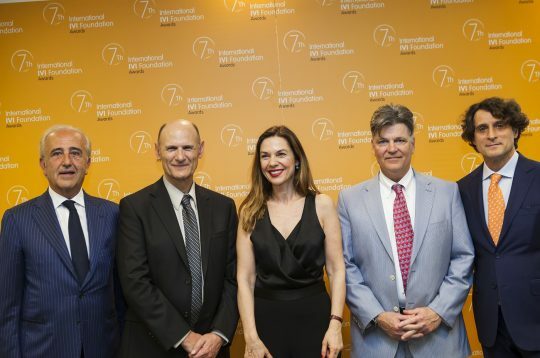 International researchers Richard Legro, Juan Carlos Izpisúa and Magdalena Zernicka-Goetz, and Spanish journalists Irene Vaquerizo and Ana Perez, have won the science and journalism awards presented by Fundación IVI, awarded in the framework of the 7th International IVI Congress. This is the seventh edition of the prizes for the best research career in the areas of basic research and clinical research in reproductive medicine, and the second occasion on which the prizes for the 2nd IVI Journalism Award for Assisted Reproduction and Maternal-Foetal Health have been presented. The scientific award presented by Fundación IVI consists of two categories: basic research and clinical research in reproductive medicine. The aim of the prize, which has a value of €25,000, is to highlight the importance of science’s contribution to reproductive medicine by acknowledging the dedicated assistance of researchers and their teams in broadening scientific and clinical horizons in order to improve the treatments and techniques used in assisted reproduction in the future. The award, furthermore, recognises the doctors’ professional careers and their contribution to research. In this context, Professor Richard Legro has won the award for the best career in clinical research of outstanding groups in reproductive medicine, while Professors Juan Carlos Izpisúa and Magdalena Zernicka-Goetz have received the prize for the best basic scientific research career of outstanding groups in reproductive medicine. On this occasion, the panel of judges for the awards was composed of distinguished figures in the worlds of medicine and research, including Professor Santiago Grisolía, President of the Fundación Valenciana de Estudios Avanzados, Professor Hans Evers, editor of the journal Human Reproduction and Professor Antonio Pellicer, Joint President of IVI and one of the judges of the Jaime I Awards. Professor Richard Legro’s main research objective and clinical practice focus on the diagnosis and treatment of polycystic ovary syndrome, as well as the study of the genetic and environmental causes that may induce this condition and its relationship to sterility. Legro has also devoted particular interest to everything relating to hyperandrogenism and obesity in women, which are frequently linked to this syndrome. He has become a world-leading authority on the problem of obesity in women and reproduction and, in general, on everything relating to polycystic ovary syndrome. Professor Magdalena Zernicka-Goetz’s research interest has evolved around knowledge of embryo development in mammals and especially in humans. Her work has enabled us to understand how human embryos are formed prior to implantation. She recently published research describing how the different germ layers are formed in human embryos following implantation and up to day 14 of development. This publication earned the accolade of 2016 Breakthrough of the Year from Science journal. Juan Carlos Izpisúa, a Professor at the Universitat de València, although a large part of his career has been spent at the Salk Institute in San Diego (USA), has been in the media spotlight on account of his research on stem cells and regenerative medicine. He has reached significant heights of success in his research work, bringing the regenerative potential of stem cells closer to curing diseases such as cancer, Parkinson’s and even deafness. The 2nd IVI Journalism Award for Assisted Reproduction and Maternal-Foetal Health was presented by Francisco Torralba, Director of Marketing, Communications and Patient Care at IVI. Journalist Irene Vaquerizo and producer Teresa Pérez (TVE), along with journalist Ana Pérez (Quo magazine), were the recipients of this edition of the award for their work in the categories of Assisted Reproduction and Maternal-Foetal Health respectively. With a prize fund of 3,000 euros and a trophy consisting of a figurine depicting the Venus of Willendorf as a symbol of fertility, this award recognises the journalistic excellence of these professionals in the dissemination of information on reproductive medicine. The panel of judges, made up of various figures from the journalism world, decided to award the prize to the report “Maternidad tardía” (Late motherhood), by Vaquerizo and Pérez, in the category of Assisted Reproduction, and to the article “Cómo se harán los niños del futuro?” (How will the children of the future be made? ), by Pérez, in the category of Maternal-Foetal Health.